AND THE WINNER OF THE COOKBOOK IS….. SUSAN WOODRUFF!!! Susan, if you could please email your address to me, I will forward it to Elizabeth Songster and she will, in turn, send you the autographed copy of this book. Congratulations!!! This post is going to highlight three items: One, I cannot for the life of me follow a recipe to the letter. Two, recipes that may be tinkered with and easily adapted are often my favorites. 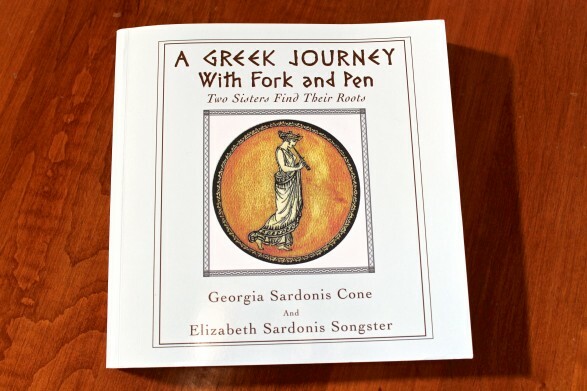 Three, the cookbook, A Greek Journey With Fork and Pen, by Georgia Cone and Elizabeth Songster offers many of these flexible recipes along with a delightful story of two sisters, their travels, and their Greek Heritage. This story began when Elizabeth, looking to promote her new book, kindly mailed me a signed copy. When she first contacted me, I said that I would be happy to cook something from her book so I could truly review it. Elizabeth and her sister’s recipes are sprinkled in between stories of their travels and adventures with their husbands making this an endearing memoir as much as a cookbook. In terms of the recipes, what caught my attention right away was the frequency of uncomplicated, one-dish meals that looked wholesome and flavorful. As I paged through the various recipes, ranging from Shrimp and Feta, Chicken in Wine, and Greek Honey Cake, I immediately marked eight entree recipes that not only looked delicious, but appeared to be versatile, easily-prepared meals — perfect for busy weekdays. The recipe which called my name the loudest was Braised Rooster with Noodles. I mean, The Fountain Avenue Kitchen’s logo is a rooster! Now, I return to my first comment about not being able to follow a recipe. Although the recipe, as written, looked absolutely fabulous, I tinkered a bit as I tend to do. Instead of using a whole chicken, cut up, I used boneless, skinless chicken thighs and I tweaked the flavorings a bit. As I was about to add the pasta called for in the original recipe, I thought about how my husband adores chicken and rice. He was actually home for dinner — not traveling for work as he is most weekdays — so, in his honor, I swapped the pasta for brown rice. When it occurred to me that I had a bag of fresh, curly spinach from our farmers market that needed to be used, I added that at the end. Now I didn’t have to make a salad! We truly had an all-in-one meal! The feedback? Glowing! One son asked a friend to join us for dinner. Turned out he doesn’t like tomatoes but he liked this meal! My younger son, who tends to only like the chunky parts of soup over the broth declared this broth, and I quote, “Amazing!” I loved the flavors, the ease of preparation, and the way I could adapt the recipe so easily based on what I had on hand and what we were in the mood for. That said, there would be nothing wrong with cooking the recipe as written. I am quite sure it would be equally delicious. One final note: Due to my schedule, I prepared this recipe mid afternoon and allowed it to sit for an hour or two before reheating gently and serving. I like how the dish thickened to something like a stew–yet with just the right amount of soupiness. The extra time also allowed the flavors to meld and develop a bit more. So, if time allows, feel free to prepare in advance, even undercooking the rice just a little so that is does not become mushy upon reheating. As you can imagine, leftovers were equally delicious…and my new broth lover requested them. To view the recipe which inspired this tasty one-pot meal, or to learn more about the book and perhaps purchase your own copy, click here. And a special thank you to Elizabeth and Georgia for sharing their stories, their love of food, and their delicious Greek-inspired recipes in a truly delightful book to which I will certainly return. NOTE: Elizabeth and Georgia, authors of the cookbook pictured below, have graciously offered to give away a signed copy of their book. To enter, simply leave a comment below. The winning name will be chosen at random on Sunday, February 24, 2013. Once announced, the winner will have 48 hours to forward a mailing address to me. If there is no response, another winner will then be chosen. Good luck! Although this recipe requires a slow braise, it is largely a hands-off meal. The slow cooking will reward you with exceptional flavor in this wholesome, one-pot dinner. Heat the olive oil in a large soup pot or Dutch oven over medium to medium-high heat. Sauté the onions for about 5 minutes, or until they begin to soften and brown a bit on the edges. Add the chicken, and cook for about 5 minutes, browning on both sides. Bring the mixture to a boil, then immediately reduce the heat to low, and simmer, uncovered, for 45 minutes. At this point, I removed the chicken to a plate and half shredded, half cut it into bite-size pieces, and then returned to the pot. Stir in the chopped spinach, the balsamic vinegar, and check for seasoning. Serve with a sprinkling of cheese, if desired. Using 3/4 cup of rice will yield a finished product that is like a thick soup after the mixture sits for a few minutes. If you would prefer to use white rice, you will only need to simmer for 20 minutes or so. If you use pasta, as was done in the original recipe, you may only need to simmer 10-15 minutes, depending on the type of pasta being used. This is the original recipe which caught my eye from the beginning. This is also what any recipes I follow end up looking like! 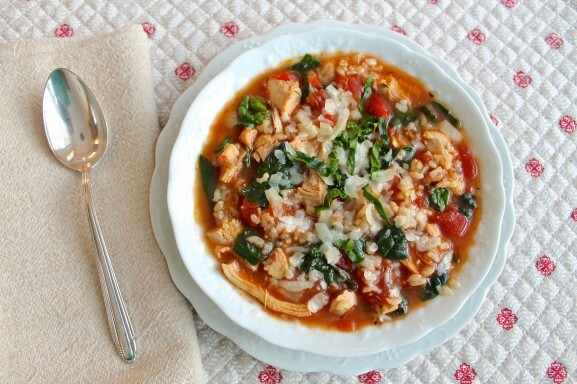 This one-pot meal is also included in Food Done Light’s Thursday’s Treasures recipe collection. I love this recipe and would love a cookbook! Yum! Being Greek I like all the recipes I can find! This looks like real comfort food I can’t wait to try it! Wow!! Looks good. This is one that I will be trying out. I love cookbooks and can never have enough! This soup looks so yummy. Will have to try it soon. This recipe is a keeper ..can’t wait to try it ..
Love the recipe … I’m going to try it! Pinned this one for a future healthy recipe round up. When I was 9 yrs old we went to Greece. It was amazing! I remember what I ate and all the wonderful flavors. I cannot wait to try this. My hubby will love it. looks delicious…can’t wait to try it! Currently living on an island in Greece for a year and trying to learn as much about the cooking here as I can…would help to have an cookbook written in English when I get back to help me continue to learn! This sounds like a delicious meal! I can’t wait to try it and I know my family will love it. Hubby is Lebanese so he’ll think it’s great! I’d love to win the cookbook! Looks so delicious. Can´t wait to try it!!! What a fascinating recipe, my sensitive taste buds are doing ‘the happy dance’. Thank you so very much for sharing. You do wonderful work! I love Greek food…can’t wait to try this recipe! Although I live here I have never had it!!! Yum! Our family could subsist on soup! Thanks for sharing! Looks yummy..will try this. Love Greek food! Delish, def making it !!! Absolutely delicious looking! I can’t wait to make it so I can try it. Yum!! The cookbook sounds great, too! What a wonderful opportunity. I adore Greek cuisine and that others share their stories. recipe looks great! will definitely try this!!! This looks yummy. And being gluten free is a good thing. Will have to try this. My family prefers white meat so could I use boneless skinless chicken breasts? This recipe looks great! Will try it tonight. I hope you enjoy, Molly! I Love Cookbooks food always sounds good to me!! Greek! I hope I get to try some of these out! Love to expand my palate…. This sounds amazing, truly my kind of meal! Love Greek cooking, too! Thanks for sharing this at Global Food Friday! This recipe was the perfect match for your global food theme. Thank you for sharing it, Abby! I look forward to trying this recipe soon. Thanks so much, Lisa. I am glad you liked the tortilla soup. We really love that one, too! This braised chicken recipe was inspired by the cookbook pictured here although I did not author the book. I sure enjoyed reviewing it though! I always look to expand in cooking. Trying new recipes and winning this cookbook will ensure it 🙂 good luck everyone . I would like to make this week, could I substitute wild rice? My husband will only eat this. All the ingredients sound delicious ! Wild rice should work beautifully, Karen. It may take a few extra minutes of cooking, so just check occasionally to be sure it is cooked thoroughly. Hope you enjoy! My new son-in-law is Greek and he would love this recipe. I think I’ll make it this weekend. Can’t wait to make it. All your recipes are delicious !!! I made this recipe recently and it was superb in both recipe accuracy and flavor. My family loved it, and I will make this again and again. It’s a keeper! this sounds so good, am anxious to try it. I think I would like to try it with white meat rather than dark, do you see any affect on the taste with that? I think it would be fine with chicken breasts, Deb. I mention in the recipe that you can cook slightly less time with breast meat, although if you keep the heat low and don’t boil, a slow braise should not dry it out. Hope you enjoy! I know I would enjoy this cookbook. Thank you for the opportunity. I am going to cook this today, it looks lovely. It would be terrific to win the cookbook too! Sounds gorgeous! I would love to try some of these recipes! Would love to win this excellent cookbook! The book looks really interesting to try out. Love Greek food but haven’t tried cooking my own…yet. sounds wonderful and cookbook too! I love cooking and this recipe looks amazing – I bet the recipe book is just superb! Hooray for a book with a gluten free section for people who can’t tolerate gluten. There are quite a few of us about! Thank you. The recipe sounds delicious. I often cook one pot meals so I’ll be sure to try it soon. I too love simple, easily-switched or overall ‘accommodating’ cooking! That’s why I adore your blog and the recipes you share. This book must be incredible! Maybe I’ll get lucky on the draw? I would love a Greek cookbook! Thanks, Ann! This is my next soup recipe to try…. I’ve written the ingredients down and I’m off to the supermarket to buy them. In terms of leafy green veggies, would kale work? Looks yummy…and the cookbook sounds good too!! It is truly comments like this that keep me doing this. Thank you, Beth…and thank you Nicole V.!!! That looks so good. I would love to have the cookbook! My mouth is watery. Cannot wait to taste all of this good food. I would love a cookbook. this cookbook looks amazing! I have tried, and successfully managed, to not repeat a recipe for long periods of time.. Ive gone 6 months at a time. I introduce my sons to meals from around the world. We ONLY eat home cooked meals. I can say that I do NOT have enough/many Greek recipes. I would be ecstatic to receive a copy of this. My sons are now just grown (earliest 20’s) and one is Autistic. One pot recipes are his fav because they arent complicated. This would make his life so mich simpler. Ty for the chance. Ps. My email is not properly working. Feel free to find me on FB. Im on your list. (Im the one with the huge name;) ty again). I love soups and this looks like one I will be trying in the near future. 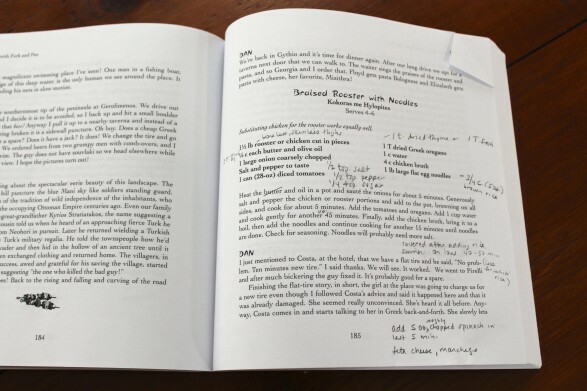 what could be better in a cookbook – a good read and good food. Thanks for sharing. Thanks for posting this recipe. It looks great. I love Greek food, this looks so good! I love to read cookbooks, this recipe sounds like something my husband and I would really like, thanks for sharing. One pot meals are so much easier, clean up also. This recipe sounded great both their way and your way. Thank you. I don’t like spinach but these sounds tasty. This recipe looks so good! I do believe that I am going to have try it sometime this week. If the rest of the recipes in the cookbook look as good as this one, I would love to win it! This sounds like dinner tomorrow, will also use wild rice. I will be sure to check out the book, too. What an amazing cook book! This looks so delicious! I plan to make it this week & I can’t wait!